Nippon Professional Baseball (NPB) is the professional organization that mostly helped the International Baseball Federation (IBAF) to organize and promote the presence of baseball at the tenth SportAccord Convention. NPB is represented in Quebec City by Secretary General Kunio Shimoda, who explained: "I am here at the SportAccord Convention on behalf of NPB Commissioner Kato to demonstrate our continued support to the IBAF and its endeavors to reinstate the sport onto the Olympic program. Our rapport has been strengthened more than ever and we will continue working with the IBAF to further illustrate to the international sport communities the message that baseball definitely is a global game". 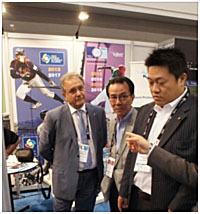 President Fraccari and Secreatry General Shimoda met at the IBAF Exhibition booth in late afternoon on Monday May 21.